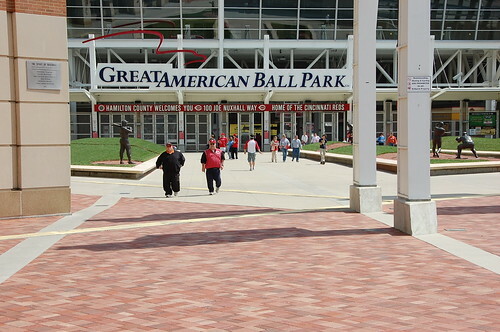 GREAT AMERICAN BALL PARK & REDS HALL OF FAME. We strolled down to Great American Ball Park a little before 2pm the day before Opening Day, our plan being to see the Reds Hall of Fame. We deliberately chose to get into town early so we could visit the Hall of Fame the day before the game, and avoid the crowds. It was a beautiful, sunny and warm day, the day that should be tomorrow, and on our way there, we passed dozens of red-shirted fans heading back from the ballpark. When we turned the corner and were about to head for the Hall of Fame, we noticed that the gates to the ballpark were open and people were walking out. My companion and I exchanged glances. “Maybe it’s open for some reason?” I said. Which is what we did. 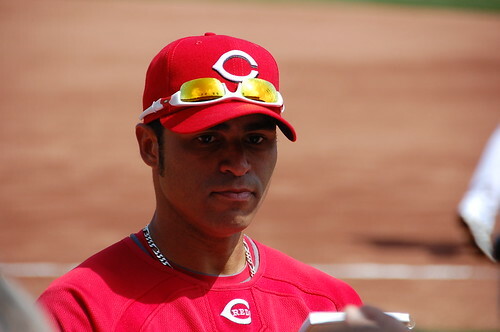 Only to discover that, like the Mets, the Reds were also having an Open Workout Day. Unlike New York, people were sitting calmly in seats and watching. 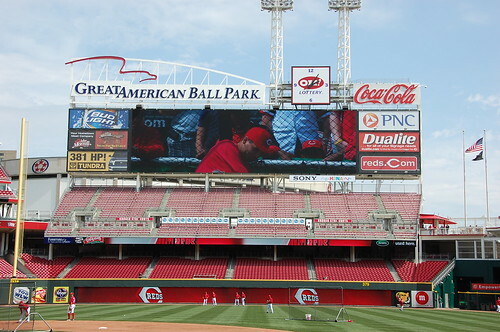 No one gave us a second look, and we were able to walk all the way down to the dugout, befriend some Reds fans, and get a beautiful, relaxed preview of the park, giving me the chance to shoot the place in the sunshine, and allowing us to not have to show up all that early tomorrow. Unlike New York, most people were sitting calmly and watching the players. There was a small line of fans clamoring for autographs, and every so often someone would come out of the dugout, walk over, and sign for a while. The mascots were walking around, they were selling hot dogs, and the insane new video screen had its debut. My other half got his photo taken with Mr. Redlegs and his female counterpart, Rosie. 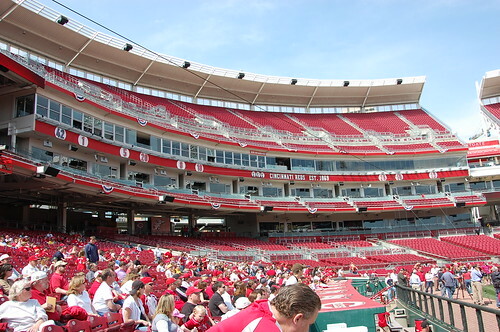 It’s a nice park, sitting on the banks of the Ohio River, with views of Kentucky and the Roebling Bridge (yes, that Roebling, the guy who built a little bridge in Brooklyn) in the rear of the ballpark. My initial impression was that it reminded me a little bit of Kansas City (which I loved, so it’s not an insult). The Reds fans we spoke with said that they thought Houston was a better comparison, but that they thought we would like this better. We were confined to one side of the park, so it wasn’t a full preview, but I was happy to get some great shots and get the basic idea so we wouldn’t have to rush to the park when it first opens on Monday and freeze for several hours. We then adjourned to the team store, where I was hoping to pick up an Opening Day hat. I had to settle for a pin and a special baseball, and we picked up a Mr. Redlegs for the mascot collection. 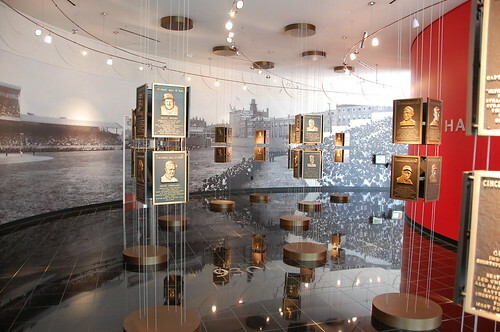 The next stop was the Reds Hall of Fame. $10 gets you unlimited admission for one year. Cincinnati has such an extensive baseball history, and the museum did a tremendous job in capturing this, going all the way back to the Crosley Field and the Palace Of The Fans. 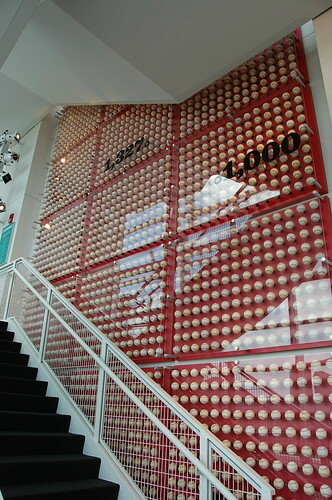 Pete Rose gets his due, with a small area of the exhibit dedicated to his accomplishments. 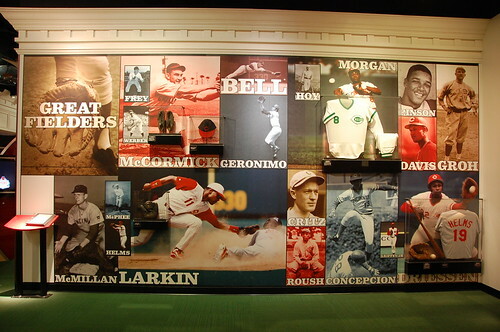 The upstairs exhibits combined Reds history with about half a dozen interactive exhibits aimed mostly at kids. There was an outfield wall, with a box of balls and small gloves where you were supposed to run and try to catch a ball heading for the wall (I did a very bad imitation of Endy), another where you can crouch down and look through a catcher’s mask while someone pitched at a target. (The SO pitched, and got up to 67 mph, and I tried, and got up to 45mph, VERY outside, and my arm still hurts). There was a broadcast booth where you could watch a scene and then try your hand at calling the incident (I did not try, but my companion did the infamous Lou Piniella throwing first base incident), and other exhibits that were similarly hands on and interactive. It was easy to understand and engage with, no matter how much you did or didn’t know about the team’s history. The last two rooms were the ones that really got me. 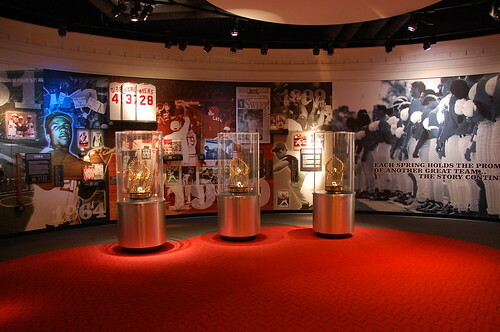 In one room, three of the Reds’ World Series trophies were exhibited, and the next room was the Reds Hall of Fame. And I think, you know, I know the Mets don’t have the kind of history that Cincinnati does, but the Mets do not even bother to try. The Texas Rangers, who have almost zero history, try more than the Mets do. Maybe they have something planned and we’ll all be delighted and surprised, but I seriously doubt that they’re even going to bother. (And are they going to offer tours of the ballpark? I understood why there were no tours of Shea, really I did. But no tours of Citi Field? Come on.) The Reds saved artifacts and made replicas and with care documented the history of baseball in their city. Photographs were allowed, posing with lockers and photos and trophies almost encouraged. They didn’t sell everything to the highest bidder. Sorry, rant over now. LIVE FROM CINCINNATI, YOUR 2009 NEW YORK METS.